Ruben Gallego (formerly Ruben Marinelarena), who represents Arizona’s most liberal congressional district (the 7th, a heavily Democratic, majority-Latino district), criticized the president when he pardoned Arpaio following his conviction meted out by a Clinton-era appointee, declaring, “Donald Trump is an absolute coward for pardoning a man who engaged in racist police practices. Arpaio was found guilty, but this shows that the legal system cannot deliver justice.” Gallego, not surprisingly, graduated from Harvard University, is a member of the Congressional Progressive Caucus, and sports a treasonous Freedom Index rating of just 16 out of 100. Gallego opposes SB 1070, Arizona’s attempt to enhance its protection against the flood of illegal immigrants entering the state. The law enhances federal law slightly, which requires all aliens over the age of 14 who remain in the United States for longer than 30 days to register with the U.S. government. It also requires aliens older than 18 to possess proper identification at all times, with violation being a misdemeanor under the law. SB 1070 added that an alien in Arizona without the proper documentation also be charged with a misdemeanor. But the teeth of SB 1070 consisted of requiring that state law-enforcement officers attempt to determine an individual’s immigration status during a “lawful stop, detention or arrest” when there is reasonable suspicion that the individual is an illegal immigrant. This was enforced by Arpaio, who required his deputies to determine the immigration status of anyone breaking the law. Simple traffic violations were enough to unleash the enquiries, and the vitriol of U. S. District Judge Susan Bolton. She demanded that Arpaio cease being so aggressive, and Arpaio ignored her. In July 2017, she found him guilty in a bench trial (not a jury trial) of defying her order, and a month later President Trump pardoned him. Translation: Enforcing the law under SB 1070 would be inconvenient for federal immigration authorities and so must be blocked. Added Bolton: “Federal resources will be taxed and diverted from federal enforcement priorities as a result of the increase in requests for immigration status determination that will flow from Arizona.” So much for enforcing the law. When the New York Times asked Arpaio about his advanced age, he responded: “I carried a gun and a badge up until not long ago, so age means nothing. I have life experience and common sense, which I intend to use for the people of Arizona.” His “life experience” is what most annoys liberals. He began his law-enforcement career as a police officer in Washington in 1954. He later worked for the DEA (Drug Enforcement Administration) in Latin America before winning his first election as sheriff of Maricopa County in 1991. During the next 23 years, Arpaio built his reputation as the “World’s Toughest Sheriff” by treating his prisoners as prisoners instead of guests. He opened an outdoor jail known as Tent City, letting his prisoners enjoy the summer’s oppressive heat as a way to teach them never to return following their release. He forced them to wear striped jumpsuits and pink underwear, enforcing the lesson: don’t mess with Sheriff Joe, and don’t come back. Treating criminals as criminals was just too much for bleeding-heart liberals, and Arpaio was targeted by the Obama administration for sanctions. 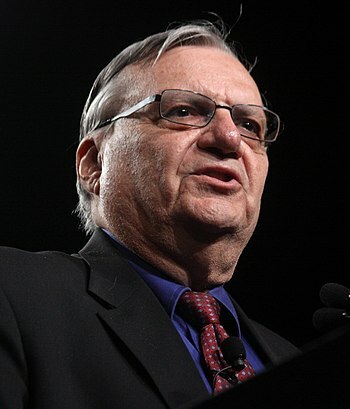 In 2011, the Obama administration’s Department of Justice claimed Arpaio was committing all manner of civil rights “violations” on Arizona’s uninvited guests, and charged him with racial profiling, discrimination, and carrying out immigration searches for illegals. That’s the history behind Bolton’s ruling in 2017 that led to Trump’s pardon. Arpaio repeatedly has noted that he arrested more than 30,000 illegals between the years 2005 and 2009. President Trump’s pardon last August said, “Sheriff Joe Arpaio is now 85 years old, and after more than 50 years of admirable service to our nation, he is a worthy candidate for a presidential pardon.” Whether Arizonans think he is a “worthy candidate” to replace Senator Jeff Flake in the Senate remains to be seen. The latest poll from RealClearPolitics shows Arpaio in the running, just two points behind the front-runner Martha McSally, and four points ahead of Kelli Ward. The primary takes place on February 27, with the winner determined by a plurality. This entry was posted	on Friday, January 12th, 2018 at 6:42 am	and is filed under Crime, Politics. You can follow any responses to this entry through the RSS 2.0 feed. You can leave a response, or trackback from your own site.